I recall as recently as the mid 1990s that watch buyers would remove military issue markings from the back of a watch or indeed prefer to buy military issued pieces with the markings already removed. Hindsight is a great thing of course and there must be many people who regret having undertaken this surgery. The market for military watches and indeed collectability of the same has mushroomed over the last decade; particularly, post war to late 1970s issued pieces are a finite resource simply because they are not manufactured nor indeed issued any more and of course in the case of certain models they were manufactured and issued in very limited numbers. Thus, original, ‘unsterilised’ military watches from the period referred to above are in great demand and prices are continuing to rise. I am referring mainly to British issue examples and long gone are the days of being able to purchase whole trays of what are now desirable watches at ‘bargain’ prices. I personally recall seeing in the catalogue of a UK based military surplus supplier Lemania chronographs for £295.00, Smiths W10s for £100, Cyma WWWs for much less. A decade on and even early quartz equipped watches are now fetching prices in the healthy £100s – viz the Seiko 7A28 chronograph. The rarity of certain pieces makes them extremely ‘hot’ on the collector market, into this category firmly fall the IWC Mark XI and Omega 6B/542. In the case of the latter, this watch was purchased by the British Ministry of Defence once only – in 1953. Numbers were of the order of 5900 pieces in total for the one contract making this one of the rarest and certainly most desirable British military watches ever produced. Two versions exist of the Omega 53 as it has become known, identified primarily by different dials: the ‘thin arrow’ and the ‘fat arrow’. The arrow in this case refers to the Broad Arrow on the watch dial, denoting British Government property. 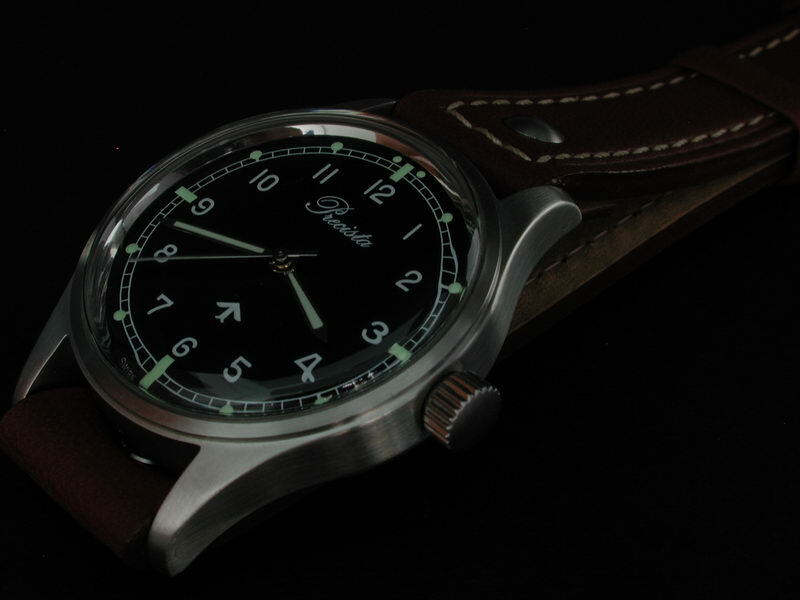 The Omega 53 originally used Radium within the luminous compound on the watch dial and this version sported a thin arrow above the six; the Ministry of Defence redialled many watches to employ Tritium as a safer alternative – these watches bear a fat arrow above the six on the dial and the appropriate circle T below the manufacturer’s name. The rarity of this and other British military watches means that being very collectible, wearing such a watch as an everyday timepiece may be detrimental to its value given the risks of water ingestion, further damage and so on. They cannot be classed as ‘wear it and forget it’ items which until recently has left something of a void for those people who like the military connection, style and the vintage feel of such pieces and who would choose to wear one on a daily basis. Yes, there are current or recent issue quartz pieces available but these do not satisfy the vintage specifications to which I am alluding. Certainly, the proliferation of military style watches would suggest the desirability of same and many manufacturers large and small are to a greater or lesser degree mimicking various military designs. Even Omega themselves have revisited the Omega 53 and used this example in producing and promoting the Dynamic range of the latter half of the 1990s. When I personally saw this watch and the use of images of the Omega 53 in the advertising I was a little nonplussed at how the company could have missed such a golden opportunity by making the was so visually different from the original. Whilst arguably attractive in its own right, the Dynamic was a long way from the 53 visually with the closest connection seeming to be the minute track and markers. Financial muscle does not necessarily translate to sense and for whatever reason the Dynamic didn’t appear to be a commercial success and was deleted within a relatively short period. Smaller concerns have also taken up the challenge of producing what are now referred to as homage watches. Indeed, I have reviewed such myself in the form of the PRS-1 Speedbird. The Speedbird was perhaps one of the first ‘real’ homage watches that really did come close to achieving that ‘sepia toned’ feeling which I discussed in the review of it. Since then (2001), one or two small and specialist concerns have attacked the homage market using expertise and attention to detail/taste that the likes of Omega and others seem to lack. What has until now not been achieved is the combining of military homage with the ability to legally use a ‘real’ military name on the dial. September 2004 saw this change with the introduction of the Precista PRS-53 from Timefactors. Omega, IWC, Jaeger Le Coultre, Cyma, Timor , Smiths, Newmark and Precista are amongst many previous suppliers to the British Ministry of Defence. Some are more widely known than others but all have at one time or other produced timepieces that met the various standards laid down by Ministry of Defence requirements (Defstans). 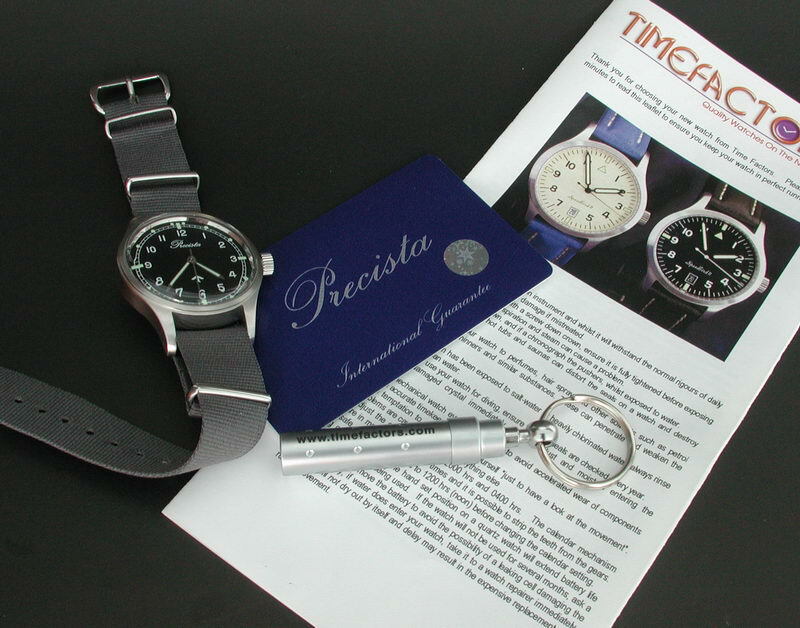 Precista was a brand which was owned by UK watch wholesaler Southerns (there had been previous owners). It would seem that Precista military timepieces were supplied for a relatively limited period of time, perhaps as short as 18-20 years. 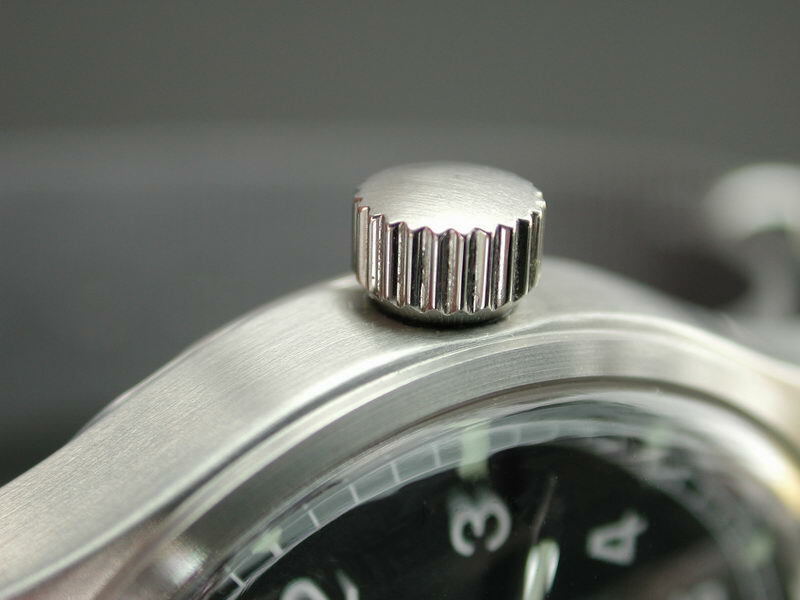 Certainly, W10 and 6BB (RAF) general service watches were issued in 1982 onwards and diver watches in the late 1980s through to 1993 utilising different case styles. Previously to this was the asymmetric case manual wind chronograph bearing the Precista name and this would date to the early to mid 1970s. By the end of the 1990s, Southerns had ceased trading and the Precista brand slipped into disuse. Thus Precista ceased to be, leaving a military pedigree; original Precista issued watches are now sought after due to their relative scarcity. Brand names have regularly been bought up (particularly by Swiss manufacturers) and resurrected in some way or other. Unfortunately, in some cases the resulting products bear no connection at all to the original. An extreme illustration of this might be the recent resurrection of the Ball Watch Company – famous in the United States for producing superb quality ‘Railroad Approved’ pocket watches and wristwatches. The ‘new’ Ball watches draw heavily on the reputation and history of the old for advertising but the products (whilst technically novel) are anachronistic in the context of the brand and ‘history’ being applied to them. In what I consider to be a truly shrewd move, Eddie Platts of Timefactors in the UK managed to acquire the Precista brand in 2003. Here was an opportunity to apply a real military name to military style/spec/homage watches or indeed to earn disdain from the watch buying community for illogical brand application. 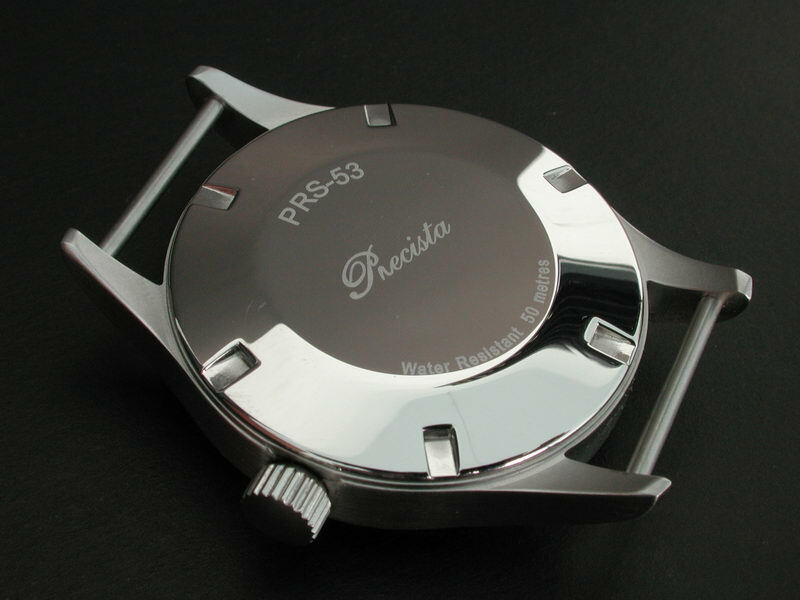 The first new generation Precista appeared in September 2004 in the form of the Precista PRS-53. In this case, the ‘53′ is referring to the intention to capture the spirit and ‘feel’ of the Omega 53 which is now so collectable. Is it just the spirit and feel of the Omega itself that the PRS-53 is trying to capture one may ask or is there more to it? Here we have a watch that is styled after a piece supplied to the Royal Air Force during the year that saw the end of the Korean war, the Coronation of Queen Elizabeth II and the conquest of Everest. During the same year in October, a Royal Air Force Canberra won the Christchurch Centenary Air Race flying from the UK to New Zealand (11792 miles) in 23 hours and 50 minutes. This was of course during the year of the one-off issue of the Omega 53. Were the crew wearing examples of this watch I wonder? I would suggest that the Precista captures the spirit of those times in terms of just how ‘old fashioned’ it is specification wise. 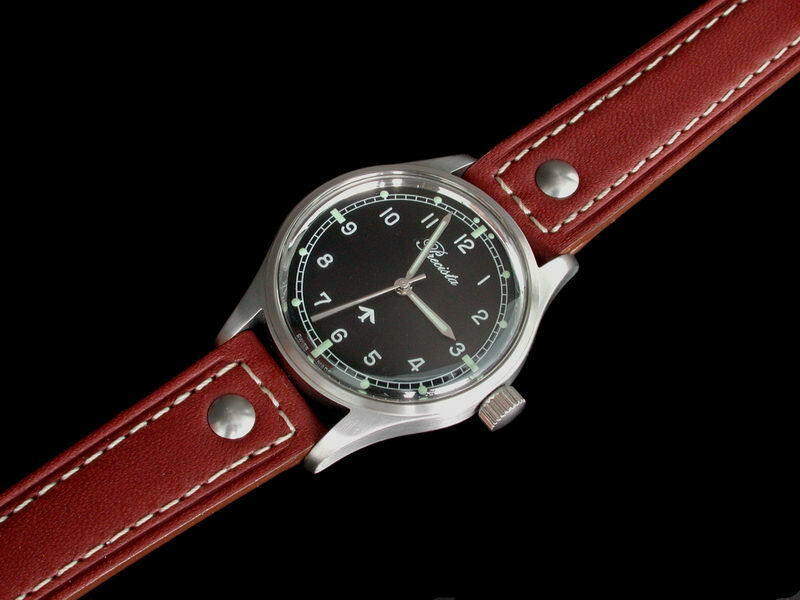 This is a manual wind watch with a dial design dating back over 50 years equipped with an acrylic crystal. Furthermore it is proportioned appropriately for watches of the time. Undoubtedly, it looks extremely similar to the Omega though not an exact ‘copy’. Thus, if one were looking for all the modern conveniences possible in a wristwatch then the Precista is not going to fit the bill. If however like me one enjoys the manual input required daily, the classic design of a simple lugged case, the fact that this watch will scratch/age and the crystal more so then this may be the watch for you! 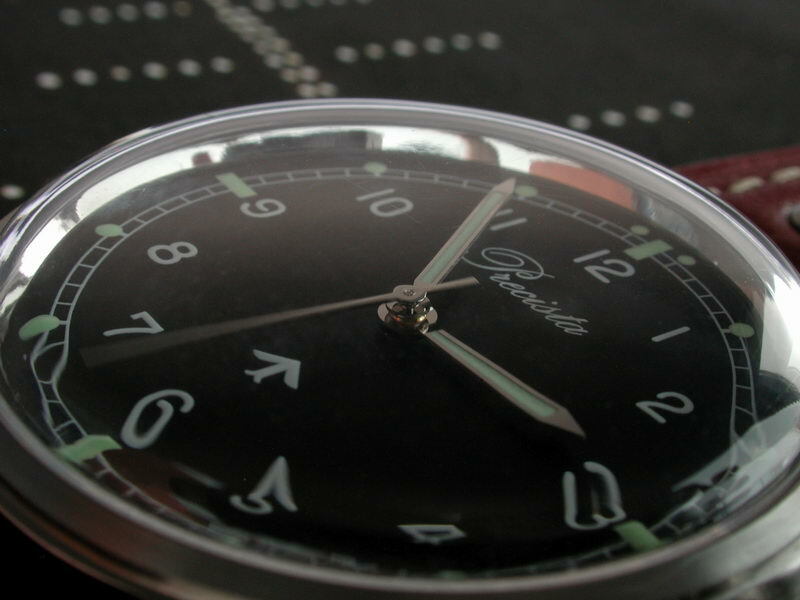 In an age of ‘wear it and forget it’ wristwatches the Precista does indeed take us back in time somewhat. Note that this watch is available in an automatic version for those who prefer not to have to manually wind once a day. Due to the dial design which was specified by the British authorities of the day, it is of course extremely easy to tell the time with this watch – undoubtedly of great importance for military applications. Yes, I can imagine a British serviceman wearing a watch very similar to the Precista within the musty confines of a Canberra so in this respect it certainly ‘captures the spirit’ for me. I acknowledge that the brand on this watch wouldn’t have been applied to military watches of the time but at least it is a genuine name, albeit of a later era. 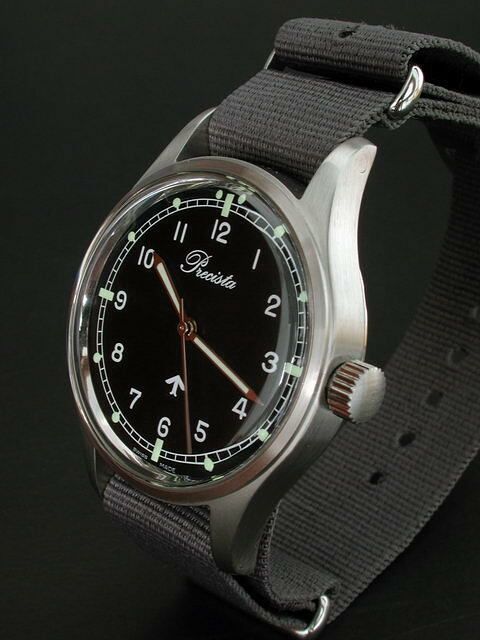 As an aside, the name Precista and the font that the brand employs has always seemed old fashioned in my eyes which seems to fit a watch of this style well. So, what of the watch itself? My example of the Precista PRS-53 arrived on Monday 10 January 2004 having been ordered from Timefactors in the UK just five days earlier. 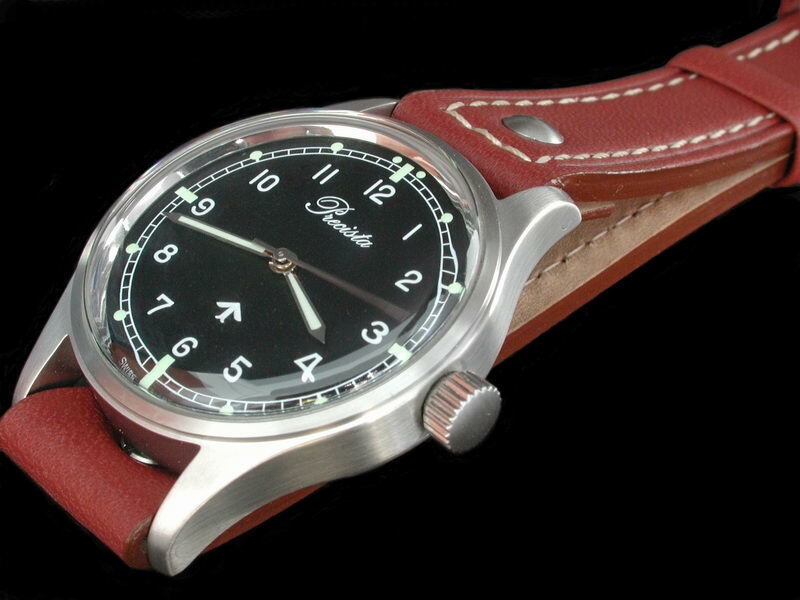 I ordered my watch with an extra 18mm G-10 strap and out of curiosity a leather Aviator style strap designed to fit watches with fixed bars (more of this later). I specifically requested that the watch be sent without the usual box in order to save a little on postage charges. Normally, this watch comes in a very substantial aluminium box, perfect for transportation and very fitting for the utility theme which the watch follows. The box is in fact branded ‘Broadarrow’ which is another line of military inspired timepieces offered by Timefactors. Within the box sits a black velvet effect cushion around which the watch is strapped securely. In addition to the watch itself, one finds a Precista guarantee card bearing all contact details for Timefactors along with a comprehensive watch care leaflet and Timefactors business card. As if this isn’t enough then Timefactors include a very handy LED key ring sized torch which is a practical free gift to say the least. A nice touch and of course an opportunity for Timefactors to ensure that one doesn’t forget their name. Presentation is therefore excellent given the price range of this watch and for customers whom ‘the extras’ are important then there shouldn’t be disappointments. I have to say that it does make a pleasant experience to open a watch one has ordered to find small extras within the package. Although I am a great believer in keeping things simple I have to admit to a smile when I opened the parcel containing the Precista. Any military inspired watch project will be made or broken to some degree by its case shape. All too often we see ‘military’ watches that bear little resemblance to that which would be the authentic or original article. Let us not forget that during the 1950s onwards, indeed possibly at anytime during the latter half of the twentieth century then watches commissioned by the British Ministry of Defence would have in the main utilised off the shelf cases available to those tendering for the contract to supply (ignoring of course specialist ‘internals’ such as dust covers). Certainly during the 1940s, 1950s and 1960s the case shape for general service/navigator watches was of ‘classic’ design in the sense of a two piece case with prominent lugs and a curve to the profile. This shape was superseded in the early 1970s by the chunky tonneau styled case employed by the likes of Hamilton and CWC for their manually wound general service timepieces. The Precista utilises a case perfectly in keeping with the styles referred to above. Thus, it embodies the profile and curves one would expect of a service timepiece of the period. The case is two piece – the case body and case back. 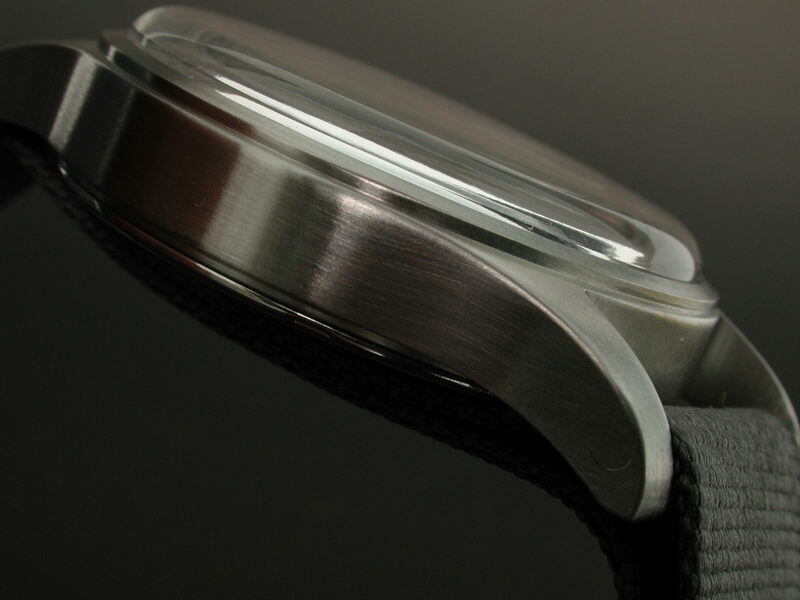 The case itself is brushed in its entirety and embodies an integral ‘bezel’. Brushing to the case is what I would term medium in texture – that is to say it is not a smooth and silky fine brushing, rather very slightly more ‘industrial’ and I might add it seems perfect for this application as smaller scratches will be hidden to some degree and do it yourself refinishing should be a snip. Whilst this review is not intended to compare the Precista with the Omega directly, it has to be mentioned that in plan view, this case is extremely similar to that used by the original. Thus the diameter of the case is a fraction of a millimetre under 37mm excluding the crown. The 18mm lug width complements the diameter of the watch ideally and once again is in keeping with the watch to which this is one is paying homage; total length of the Precista is 48mm lug end to lug end. This watch features 1.5mm thick, fixed lug bars meaning that one can fit either a NATO strap or an open ended leather strap of some description. The height including the crystal is 12.75mm though the watch wears ‘thinner’ given the domed profile of the acrylic. A note on the diameter: the Precista would represent perhaps the largest of issued non-diver watches of the period and in this day and age of ever larger wristwatches it is for me, a good thing to see that the original size has been adhered to. At just on 37mm, the watch is wearable and one is unlikely to make contact with every door post one passes. I always found issue watches (aside from the Omega 53) to be a tad on the small side at 35-36mm. 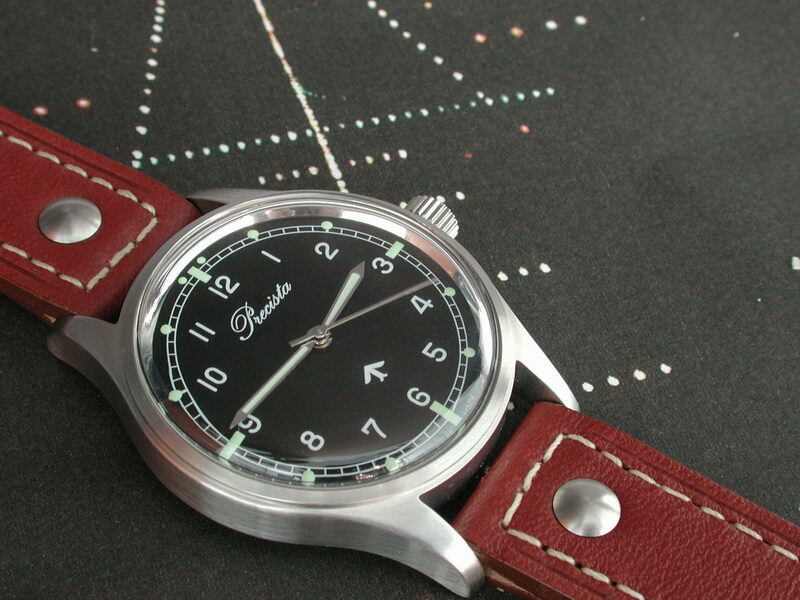 Brushing directions for the various case facets are logical and embody horizontal along the sides of the case, concentric to the 1mm integrated bezel. The lug tops are brushed from front to back which again, should make any home refinishing relatively simple. As readers of my PRS-1 Speedbird review will appreciate, I am a great lover of that curvature of the case that both the Speedbird and this Precista demonstrate. Indeed, if anything, the Precista demonstrates this in a more fluid manner than the Omega given that the case sides of the Omega are much less deep and thus require a ‘step’ in order to bring the lug bottoms closer to the wrist. 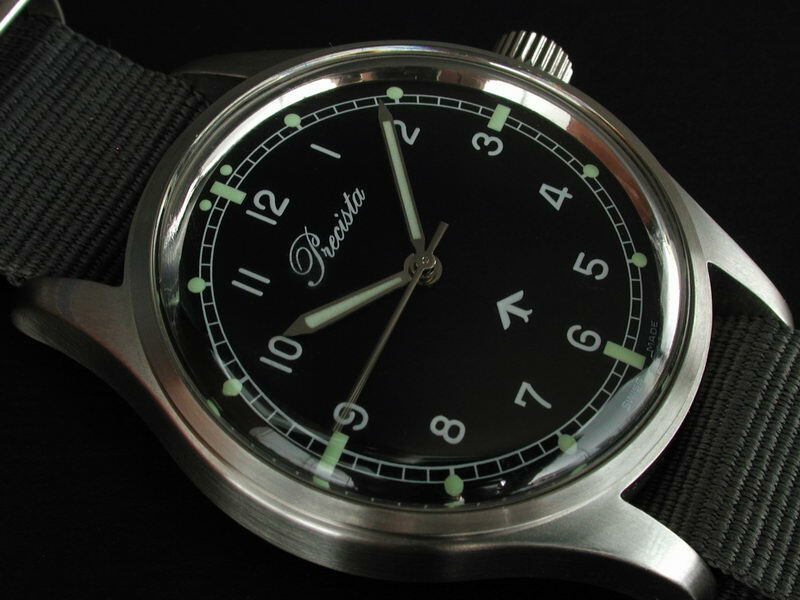 As an aside, the Precista case (likewise the Speedbird) is extremely similar (though larger) to that of the Smiths military of the late 1960’s. I have often wondered at such a similarity but again, we are no doubt dealing with ‘stock’ cases which is perfectly acceptable in my opinion. This brings us to the back of the case which is the only highly polished part of the watch. As it should be, the back is a screw fit and sealed with a synthetic ‘O’ gasket helping to contribute to the watch’s 50 meter depth rating. There are no pseudo-military markings to the case back; it is simply etched with ‘PRS-53′, ‘Precista’ and ‘Water Resistant 50 metres’. The ‘lack’ of military markings lends credence to Timefactors’ assumed intention to create a watch ‘in the style of’ which I find refreshing. The case back is very nearly flat with perhaps only a 1.5mm dish to accommodate the six slots for removal and of course the rotor if one were to choose the automatic version. Thus, the watch sits very comfortably on the wrist which is good given use of the standard issue NATO strap which can tend to lift a watch somewhat. Finally to the crown. The Precista is fitted with a non-screw down, ‘O’ ring protected crown. This measures 3.9mm in width and 6mm in diameter with coarse enough splines to allow for easy manual winding. It is not as large in diameter as those crowns fitted to the likes of the Omega 53 though features a bevel to the case side which is very attractive and assists in pulling the crown out for time setting. The tube is some 2mm in diameter and there is absolutely no wobble from the crown in either winding or setting positions. It feels very solid indeed and does give the feeling that it will provide many years of trouble free use on a daily basis. The end of the crown is brushed straight across to match the rest of the case. The dial of the Precista is where it excels and where I feel that older issue watches score somewhat over current or recent issue British watches. Thus, the dial pattern is that of the Omega 53 ‘Fat Arrow’ which as mentioned earlier was in fact a redial undertaken to negate the potentially dangerous use of Radium on the original ‘Thin Arrow’ dials supplied by Omega in 1953. The dial base is of course in matt black. Thus, we have an outer railway track in white with luminous dots to the 5 minutes and luminous batons at 12, 3, 6 and 9 (the baton at 12 being accompanied by luminous dots either side). It will be noted that the dots are not centrally located on the outer track and this is exactly how it should be on the ‘Fat Arrow’ dial. The railway track is very well printed in gloss white with no breaks or inconsistencies in the printing. Application of the luminous (Luminova) to the dial is likewise excellent; being very consistent, with the compound having the shiny surface finish commensurate with the bulbous profile which results from the thick application as opposed to thin printing of budget watch dials. Arabic numerals are of course standard fayre for a military watch dial and whilst I find the current issue watch dials from Britain extremely legible, I personally prefer the greater finesse of the older style dials. I am of course referring to the use of a thinner and more widely spaced font. The diameter of the visible area of the dial is 31mm which actually looks larger than it is given the use of the railway track (thus no long minute markers). The font used by Timefactors for the Precista is I would venture 95% identical to that of the Omega 53 and most certainly again ‘catches the spirit’. Application of the numbers is in gloss white, very crisply done with no flaws under a 10x loupe. Interestingly, the effect of the smaller font is that one feels one has taken a small step back before reading the time – the watch dial doesn’t come up and hit one in the face so to speak. Yet, as intended it is very easy to see the time at a quick glance. Given the available space on the dial I feel in this case things would look a little odd if it were left without logo or markings of some sort. This is where Timefactors is able to draw on the ace up its sleeve – the Precista logo which can be legally applied to finish what has to be said is a beautifully legible and executed watch dial. Thankfully, the logo has been tastefully used and not emblazoned across the dial in 5mm high letters. Indeed, the lower case comes in at 1mm in height with the ‘P’ at a jot over 2mm. I am uncertain as to the age of the Precista logo – suffice to say it certainly does not use a modern looking font and I am happy with this for use on watches of this type. It works. Balancing the dial above the 6 is of course the ‘Fat Arrow’. This is the only concession to adorning the Precista with a marking that would strictly belong to an issued piece. Suffice to say, it does indeed balance the dial, it looks good and for me personally is infinitely more desirable than a depth rating, a statement that the watch is ‘manual winding’ or indeed what is arguably the laughable practice of stating the movement model number used in the watch. The Precista employs highly polished hands with a thick Luminova fill to the hours and minutes hands. Cut and polish of the hands is excellent and whilst length and shape do not follow the Omega 53 to the letter, they are nonetheless in the military style and mimic almost exactly other issue watches of the period (e.g. Hamilton GS). Minutes and seconds hands just about reach the railway track making it very easy to read minutes and seconds to the nearest, if one is so inclined. The luminous compound is applied thickly and evenly to the hands and gives a decent glow for night time reading. In low light situations the use of highly polished hands seems to serve another purpose as a slight reflection is given off from any available light. A slight tilt of the wrist and it is possible to read the time even if it isn’t dark enough to ascertain from the luminous alone. I assume that the hands are rhodium plated but cannot confirm this. An acrylic crystal with domed profile is fitted which is exactly as it should be. This stands proud of the case by some 2mm with the vertical section of the crystal accounting for about 0.75mm of this. Yes, this crystal will scratch but yes it can easily be polished. I have referred before to the strange phenomenon of a battered stainless steel watch with a perfect sapphire crystal. A battered stainless steel watch with a battle scarred acrylic crystal is more fitting in my opinion and lends to what one might term ‘graceful ageing’. Reflections are kept to a minimum with the acrylic and the unit is secured with a polished internal tension ring. A decent power reserve of 46 hours should mean that the 2801 stays well within its optimum power output/stability band if wound on a daily basis. In addition of course, the high beat of 28,800 per hour helps to ensure some stability of rate. My example winds relatively smoothly with a strong reverse on the click spring when backing off from winding. Suffice to say I always advise a quick reverse turn of the crown once any watch is fully would to ensure no adverse over tensioning of the mainspring. My reason for choosing the manual version over the automatic was simply that this seemed more appropriate for a watch of this type and if one wishes to get into the spirit of things then I feel one should do so properly! It is in fact somewhat refreshing to have to interact with the watch once a day in order to keep it running. I am uncertain as to the different grades that this movement is available in but from a performance perspective, mine is well up to par with an average gain of less than two seconds a day whilst worn 24 hours over the first week of ownership. This is actually superb performance for a watch which comes with no extra adjustments and very much in keeping with the accuracy that would have been expected of the Omega 53. For someone who has a penchant for fitting NATO straps to just about every watch he owns then the Precista is a welcome addition to the fold. The fixed lug bars ensure that fitting of little else is possible, certainly if one changes straps on a regular basis. The watch comes as standard on a choice of NATO strap; grey, black and ‘James Bond’ are amongst those available at the time of order. I elected to go with my usual choice of grey NATO and it should be noted that Timefactors now supply NATO straps with stainless steel hardware. This is welcome upgrade given the propensity of hardware on earlier NATOs to either show brassing or indeed turn black. Little else to say about the NATO apart from the fact that it is a perfect match for this watch. Back in the 1950s, such a watch would have been fitted with either a canvas strap similar to the NATO or possibly a ‘Bonklip’ bracelet. Pilot straps in leather have of course existed in the past and recently have become remanufactured in Europe. Timefactors have recently introduced their ‘Aviator’ strap to satisfy the demand for a leather strap of strength which can be fitted to a watch with fixed lug bars. On seeing the Aviator on the Timefactors site I felt I would like just to try one – both to see how it looked on the watch and also to satisfy my curiosity as to how such a strap could be offered for GB£12.50. As may be seen, this strap fits and suits the Precista very well and seems in keeping with the watch style (it is 18mm in width tapering to 16mm). Fitting is easy; the strap is open ended with one stainless steel stud and screw which is inserted from the underside after wrapping around the lug bar. Very simple, effective and can be accomplished with a small screwdriver in seconds. It does indeed give a whole new look to the watch for those who prefer leather over nylon. For GB£12.50, this strap deserves some attention: construction is of four layers of medium softness hide with a matt finish to the top. The sides are cut edge and very thickly varnished/sealed. Thickness all told is 3.5mm and when new the strap is relatively stiff which adds to the hefty overall feel of it. The layers are glued and stitched (with heavyweight thread) together with a good 1mm+ of leather thickness available to secure the strap to the lug bars and at the ‘other end’ to ensure secure attachment of the brushed stainless steel buckle. The strap is stamped parallel to the stitching which gives a nice contrast to the top surface and finishes the design off well. 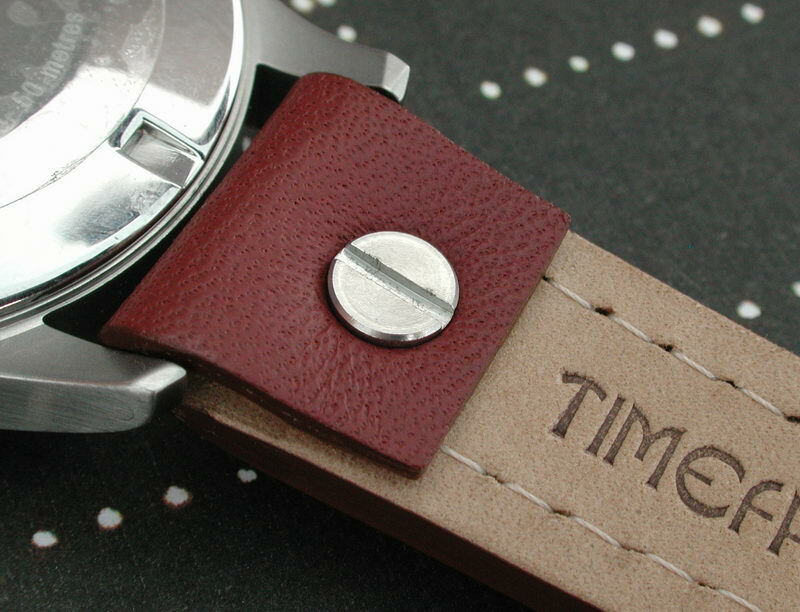 To the underside and the lining is natural finish; stamped with the width on one side and with the Timefactors logo on the other. Although I am not a leather strap fan for everyday wear I have to say that for a heavyweight watch strap, this Aviator offers exceptional value for money, so much so that I had to double check the price after I saw the invoice. It is a good accompaniment to the Precista and I would highly recommend it. 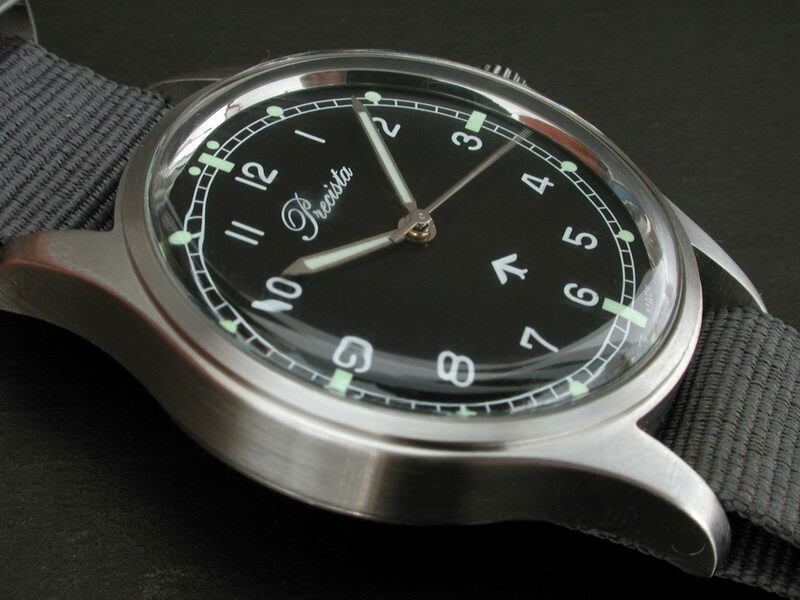 The Precista PRS-53 represents the first use of this brand since its demise in the late 1990s after having been used to supply watches to the British Ministry of Defence. I feel that it has been appropriately applied to a timepiece that goes a very long way to capturing the spirit of the watch and times on which it is based – the Omega 53 from 1953. 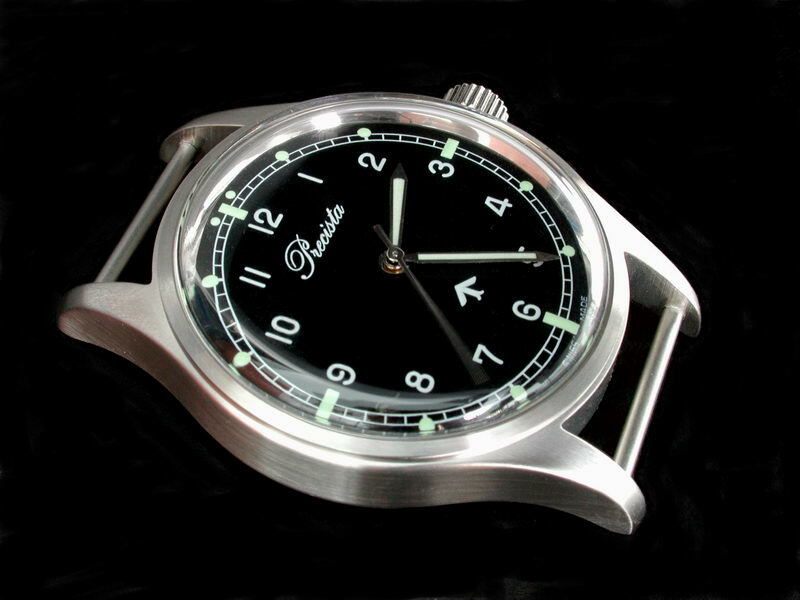 In an age of increasingly complex (and large) electronic timepieces and indeed mechanical timepieces the Precista bucks the trend somewhat and requires user input in order to keep running; furthermore it does no more than tell the time – albeit extremely legibly and accurately from within a classically proportioned and shaped case. The watch as reviewed costs GB£125.00 on NATO strap and is exclusively available from Timefactors at this time. The quality:feelgood:price ratio in this case is I feel excellent and I look forward to owning further Precista watches as they are developed. Tagged Precista, PRS-53. Bookmark the permalink.